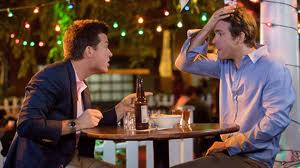 The Ryan Reynolds/Jason Bateman switcheroo comedy will change-up Blu-ray in November. In an early announcement to retailers, Universal Studios says 'The Change-Up' will have a Blu-ray release on November 8. The movie about a married father who accidentally switches bodies with his best friend which leads to a series of wildly complex difficulties was generally panned by critics this summer. The Blu-ray/DVD/Digital Copy combo pack will feature 1080p video, a DTS-HD Master Audio 5.1 soundtrack, and supplements will include: Audio commentary with director David Dobkin, Time for a Change: Featurette with cast and crew, Family Matter: Behind-the-scenes featurette with the special FX team, Gag Reel, Deleted Scenes, pocketBlu, and BD-Live. You can find the latest specs for 'The Change-Up' linked from our Blu-ray Release Schedule, where it's now indexed under November 8.